A 30-year-old man was viciously attacked by a lion during a performance in front of hundreds of circus spectators - including children. The tamer was rushed to hospital in a serious condition at 5:10pm on Sunday after the beast pounced in the middle of a Buffalo Circus show, in Doullens, northern France. Several people from the audience were also taken ill,Le Courrier Picard reported. The man was "deeply wounded" by the lions "claws and fangs", according to French news outlets.The tamer had been working with his lions for several years, a circus representative said. 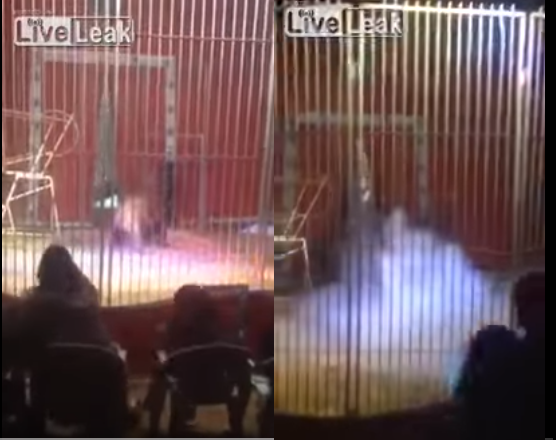 In footage of the horrific incident, the lion sinks his fangs into the tamer before dragging him across the ring.The lion was later euthanized .